Wow! Any of these things would make a great addition to the collection of any paper hoarder. Great giveaway! Great blog post and great deal! 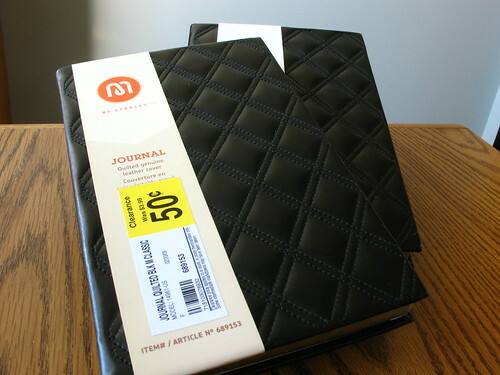 Congrats on the clearance buys, nice deal on the Staples journals! Karen at Exaclair is wonderful for contributing items for so many people to review and provide interest in their great products. Rhodia, G. Lalo paper and more! I want to win cool paper!! YEEPA! Nice reviews by the way. I also buy notebooks whenever I see them on sale. As a raving Canuck I'm already closer to the trees than most. I love all things orange and black, and would delight to find an A5 or A6 webbie in the hollow tree stump. These Orange 'webbies' are like the proverbial rocking horse poo here in the UK, so if you are giving one away - I'd love it thank you please! Besides, I have someone who works with me who's nickname is 'Webbie' and my favourite colour is orange. As if that wasn't enough, I'm a fountain pen user - signs it should be me!!! Seriously though, great revue and it makes me want one all the more. Good job! chance to win some more paper! 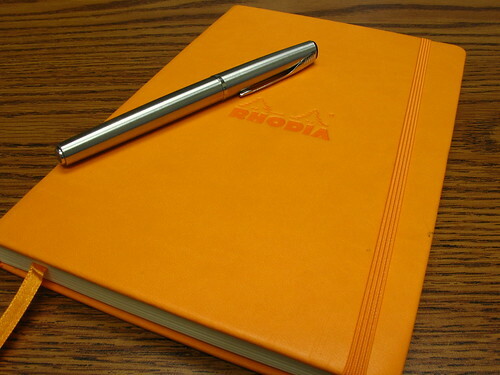 Keep the review coming and especially more Rhodia talk. Looks like a nice notebook. Thanks for the opportunity. I wpold just love to win a fountain pen friendly journal, but the ruuner-up stuff looks pretty good as well. Oh, baby! Those are some fine looking covers. And just the opportunity I need to rapid-fill my current notebook with voluminous and crappy poetry. Don't let me down, lady luck! I just absolutely adore these webbies... I need more, more, more! Well, I was just yesterday making fun of myself for making my own botepads by folding a piece of cheap copier paper over thrice. Some kind of decent paper would be a treat and a half. Sign me up! Here's wanting to leave my comment for a chance to win one of these. Thanks. Great review and excellent photography. I'd love to get my hands on one of these! Thanks for the chance! Yay! More paper! I love getting stuff in the mail! 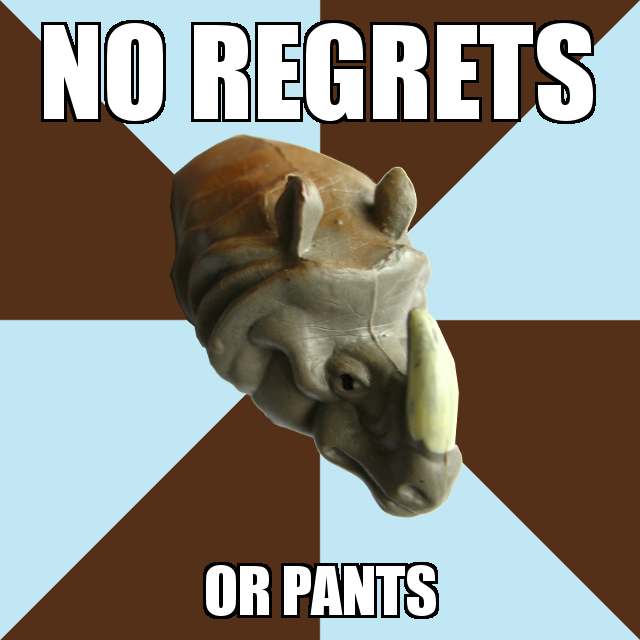 Randomness doth intervene in the affairs of men (and gals, too) when it comes to the chances of winning a Rhodia. 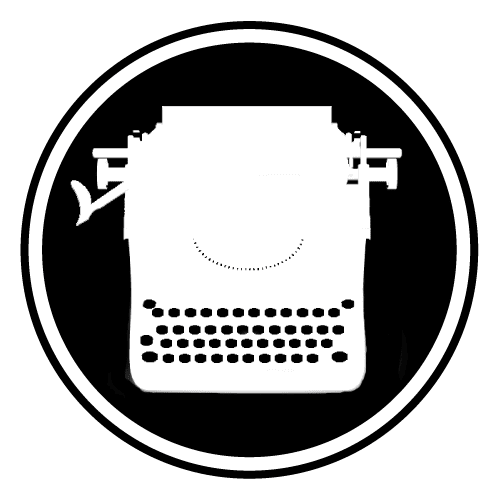 Thus, thank goodness this ain't no writin' contest, fer sure! Thanks for the review, and your non-selfishness in sharing your Rhodia fortune with us poor anonymous ones on the interwebs. Mike C. is a god among men, a truly cyclopean bastion of benevolence and verisimilitude. Woe betide the man that compares himself to the Clemens, for it is like unto comparing oneself to a paragon of genius. Wait...what? You said a non-spam post? Oops...my bad. Nice review, Mike! The testing of different pen types and widths was very helpful. I hadn't heard they'd finally come out with the blank version of the Webbies, which is what I'd much prefer to lined. I covet. I covet greatly. These are great notebooks. Better than anything similar I have tied. I saw those webbies somewhere online, and also lamented the fact that I live in the non-big-city part of the midwest and have nowhere to go to put my ink-stained hands on one. I use fountain pens in the Rhodia pads I have (which is 80g paper) and don't have any issues with it, so I'm guessing that 90g stuff is even better. Thanks for a nice review. Now I'm even lamentier! Wowo thats a great review and such a generous offer. Thanks for this review I always thought the webbies were not good for fp ink. Ooo! Cool giveaway! I haven't tried any of the papers you're giving away but the Rhodia and it's fantastic! Super fountain pen friendly. Count me in! They look like great notebooks! I have yet to come across the webbie notebooks here in Australia - although I do live 700km's from the nearest city! You are a very nice person. I like your blog. We are not at all strange, liking simple things like ink, and paper, are we? Oh I didn't know there was a blank larger Webbie available! I have the lined one, but prefer blank always. I'll have to check back at my online Rhodia sources for a blank one...not that I wouldn't also like to win one! I'd love any of those! And thank you for offering them! I wanna try the Webbie. I'm using the ePure right now and wonder how the Webbie differs from it. and 70's pads collected and hoarded over the years in the garage! I pull one out for each trip I take. At any given moment, an orange pad Is available in a corner for your writing pleasure. You are a most generous blogger! I especially love orange, but would not refuse any gift that a random number generator might select me to receive. 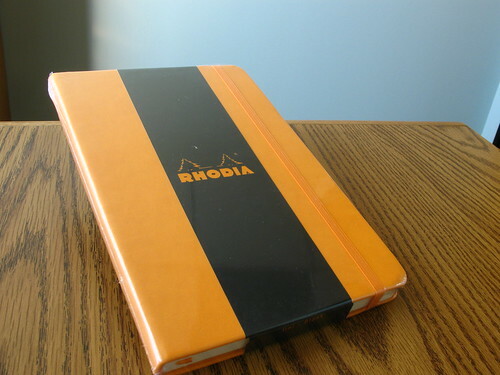 Rhodia's amazing! I keep a no.12 dotPad in my pocket all the time and have a no.16 margin ruled notepad (or three...hey, it's not my fault! They came in packs of three! ), but I'd love a webbie as well. Seems more suitable for journaling. 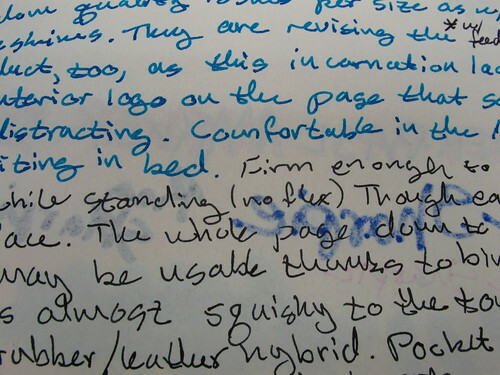 I love GOOD paper, so I usually with journals that have a nice heft to the page, can hold the ink, pencil or paint. I will confess that I am down on my paper stash at the moment. Nice review! I'm a huge fan of Rhodia as well. All of my ink reviews are done on Rhodia or other Clairefontaine paper for a reason - it's simply the best. I'd like a chance to win a Webbie! MEMEMEMEMEMEMEMEMEMEME! I linked to you once, so all five of my readers have heard of you. And I'm going off to restart school, so I am by definition in need. And I have a manual typewriter that is definitely not portable, and two polaroids - all inherited. I am a blueblood hipster. Me. Definitely me. That orange colour is simply HOT. It makes you want to write smart and sassy song lyrics just looking at it. I want to win paper!!! 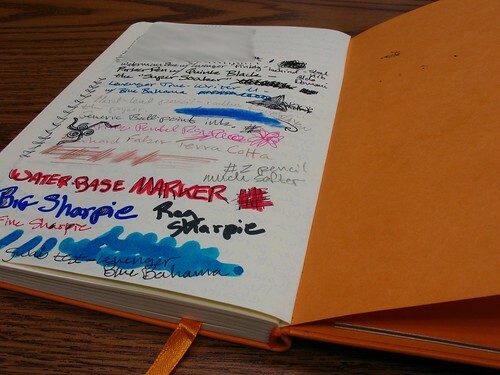 I actually have a similar Rhodia notebook on its way to me, but I'd welcome a second. Great giveaway and excellent consolation prizes. free stuff in the mail, yes!!! 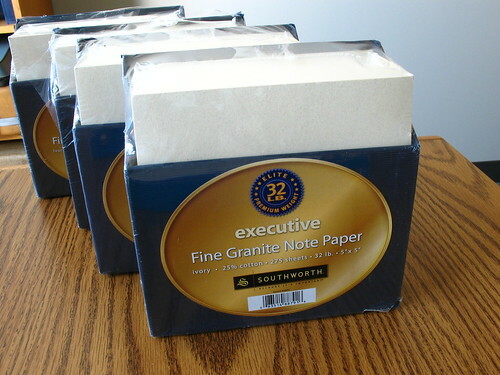 especially fountain-pen-friendly paper! w00t! Great review and I am interested in trying Rhodia stuff, but my local area is not kind to paper! I thoroughly enjoyed your review, almost as much as I would enjoy getting a Webbie. 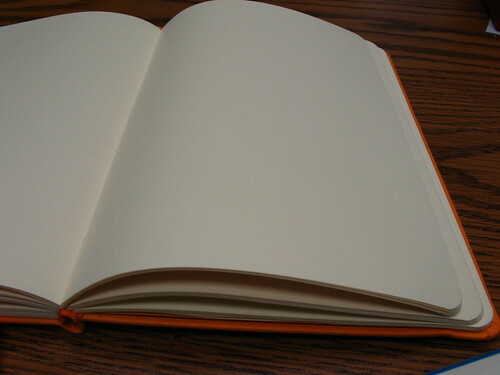 I love blank paper and the orange cover would likely double as an alarm clock if my batteries die. Of course, anything paper would knock my socks off ... assuming I was wearing them. Thanks so much for your generous give-away! Wow is right! 52 and counting! All of those are lovely, especially the Webbie. Good lord, if I won that it'd be near impossible to lose in my purse or bookbag. As for the clearance buys, nice deals and its the only way to go half time time! Nothing like the feel of a fine pen on lovely paper....thank you for the chance to win! I'd love to win these. Cool review! Very nice review! I've been interested in trying out a new blank Webbie for some time now. Would love to win the Lotto on this on! A very helpful review - your rigor in testing is appreciated! An orange Webbie would be eye-catching to say the least. Make today my lucky day, Thanks for the great blog post! Holy crap! Not one, but four prizes! I think I like it here already! Love my orange Webbie. Dream for us Fountain Pen users. I've never had a Rhodia. Would love one. Thanks for nice review and I like your Pen Test!! 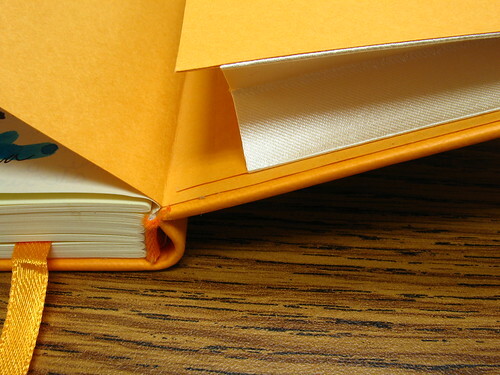 I love Rhodia as well as the chance to explore other kinds of paper. Thanks! Take pity on a poor girl stuck in the boondocks of West Texas and send me an orange Webbie! Great review! I especially like your methodology of testing with a wide variety of inks and markers - very good stuff! Christi and I both need these notebooks. Both of us don't have access to Rhodia products. I live in rural NC and I can't find anywhere at all within 200 miles that has a selection of Rhodia whereas I can truly get a hold of the product in my hands. 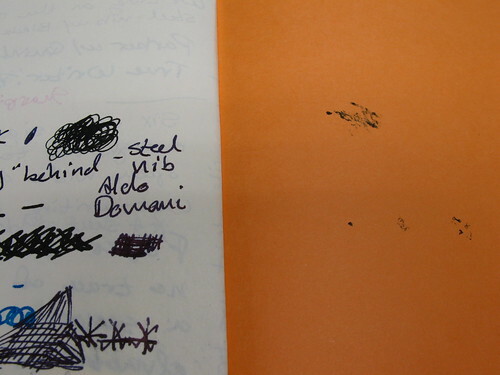 Hi, just clicked through from the Rhodia blog. Your notebook torture test is very informative. And what a fun giveway! Thk's for the chance of a new experience!!! Nice post - I so volunteer to win any of these wonderful notebooks or paper! Please enter me for any of the above - thank you! 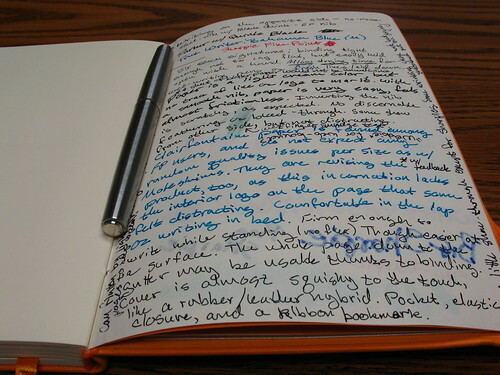 I would like a chance at trying and reviewing a Rhodia as well. Count me in!! Lot's of great prizes! So, free stuff in the mail, Staples (and Office Depot) Clearance, paper, and sarcasm are on my list of top favorite things. I think I'm a good fit for any prize! No really, I don't know how you'll let them go but thanks for the offer. ...do you visit the office supply stores once a week looking for clearance like I do??? Oh God! How can I get your attention? What are you looking for? What about why I NEED a Webbie. I live in a City where you go into a stationary store and ask for Rhodia, they say HUH? Do you have any Noodlers ink...Wha?? Clairefontaine lives over on Cherry Lane. SMALL TOWN. I collect fountain pens and have to write in blank artist sketch books to have decent paper. Alright! Alright, I have a couple of Molskine's. There are no shortage of Molskine's in this city/town but I dream of pulling out that Orange Baby in Starbuck's and laying down a line of Waterman 'Havana Brown" while drinking my grande "Americano' and scarfing a Lemon Poppyseed ( crack to me ) Torte. Did I mention that my middle name is Webster? My blog name is Webster? Your probably going to give your Webbie to some young big chested blonde who thinks her blue bic is a fine writing instrument and not some old, fat, flat chested (I wish), white haired fart who thinks that owning four fountain pens is only a start to a collection. Look at me I'm practically begging for a Webbie. Practically HELL, if you could see me, you would see that I'm typing this on my knees and I don't think I will be able to get up because I lost all the feeling in my legs. Send me my Webbie. You'll have to dig deeply into your pockets though because I live in Canada. Thank you for the great blog on it! Oh man. That pen is killing me. Rhodia is so good. Great review, I appreciate your thoroughness. I'm delighted that Rhodia is now using Clairefontaine paper in their notebooks. It's my favorite fountainpen friendly paper because it is smooth, and at 90 gsm does not bleed through. 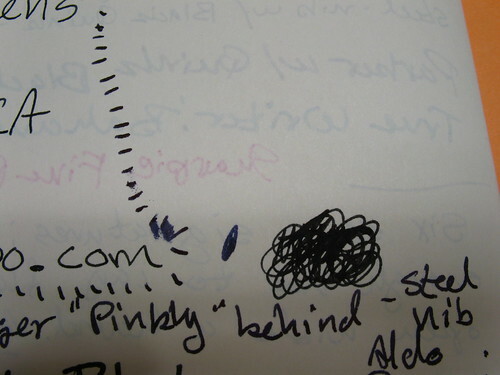 I also really appreciate the rouded corners of the webnotebook. It's a seemingly small detail, but it makes such a difference in writing comfort, not having sharp corners run under your forearms. 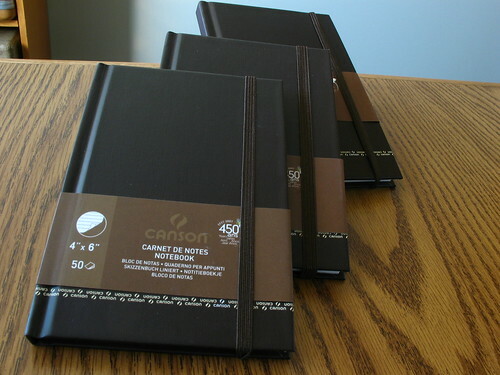 All those notebooks look fantastic, but he Camsom and the Webbies have a paper that the nibs of my pens want to meet. Great way to give others the chance to test them, very generous of you! Thanks for the detailed writeup. I really like my Rhodia Academic notebook, but I've been eyeing one of these for next year! Cheers for the opportunity from "wrl" at FPN. If I win the Webbie, please drop me down - I'd be very interested in the other items you are giving away. Passing on the Webbie, because I have one to giveaway myself. LOL. 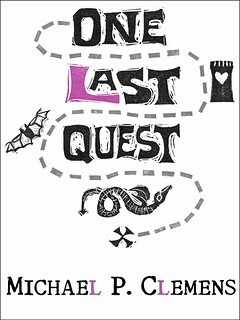 Great review and great giveaway! Thank you for doing this! Webbie-a-Palooza! This is the Woodstock of giveaway postings for the Webbie. My chances look small, but better than not entering at all. Thanks, to you and Karen at Exaclair. I'm really curious to how this performs with my pens. Some of mine are picky, and even rejects some nicer paper.